This past week I have been avoiding the kitchen. Don’t worry I am not on some crazy January diet that involves me starving myself or anything, goodness no. For those of you who read my last post you’ll know that my boiler died a death over a week ago, which has resulted in my house becoming rather Baltic. The kitchen is the coldest room in the house so instead of pottering in there as I normally would, when the heating works, I have been hibernating in one of the smallest rooms in the house – the study, with an electric heater going at full blast. It’s fairly roasty toasty so I try to avoid leaving it for long periods of time. However, when my mother in-law (aka my culinary spy) recently came back from a trip to Sri Lanka, she handed me a piece of paper with a very short ingredients list for a tamarind noodles dish that she has eaten and adored by a chef called Anura. If you are out there Anura and are reading this then this dish is in honour of you. The recipe was for the sauce itself and I just got creative in turning it into a dish that my whole family will adore. 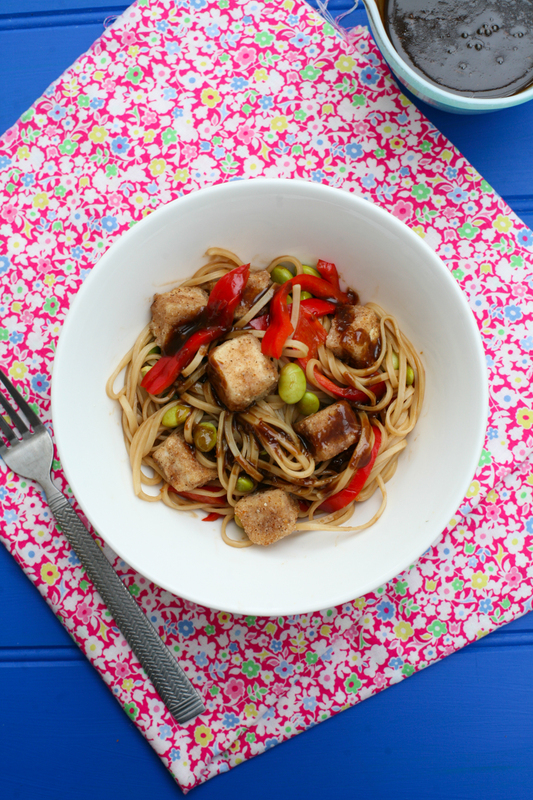 If you don’t love tofu then you could always replace it with chicken or pork by following the same steps, but crispy five spice tofu – what’s not to like folks! Take a look at those crispy tofu bites, with sweet red peppers, soya beans and tamarind noodles, which have been coated in yet more tamarind sauce. 1. 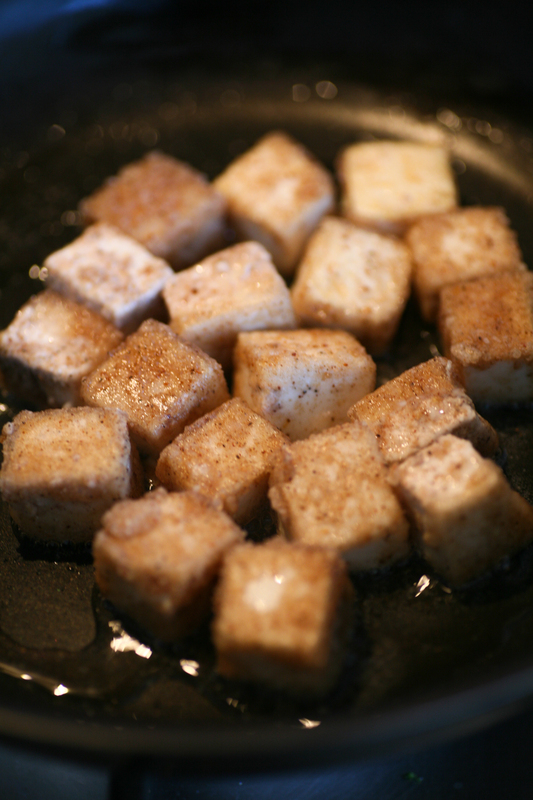 First cut the tofu into bite sized cubes. Place the cornflour and Chinese five spice into a shallow bowl and then add the tofu so that the cubes are all coated in the flour. 2. Heat a pan with the oil and when it is hot add the tofu in batches, turning at intervals so that it browns and crisps slightly. Place on kitchen roll to soak up the oil whilst you are frying the next batch. 3. Boil all the ingredients of the tamarind sauce until the sauce is smooth. Transfer to a pouring jug. 4. Using the same pan as the tamarind sauce, gently fry the sweet red peppers so that they soften. This will only take a couple of minutes. 5. In another pan boil some water and add the soya beans. After 3 minutes add the noodles and cook according to packet (usually a couple of minutes). Strain and place in a mixing bowl along with the sweet red peppers and 2 tbsp tamarind sauce. Mix together well. 6. 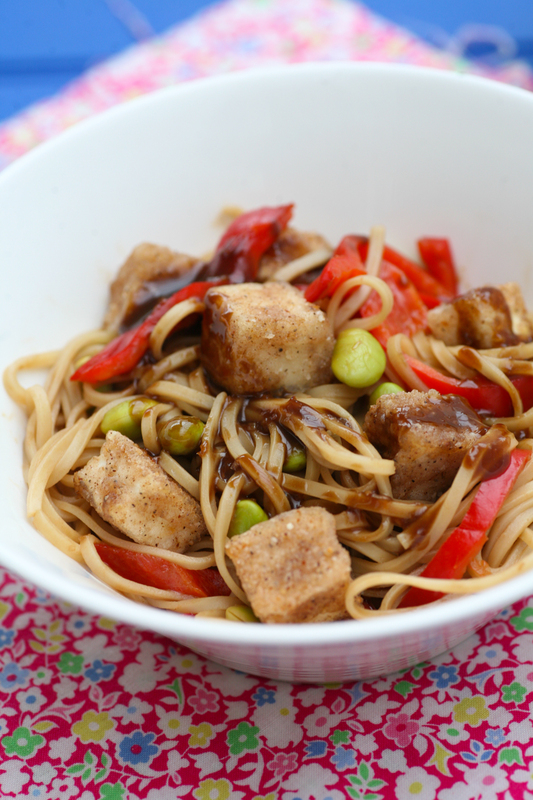 Place the noodles into bowls and add the five spice tofu on top along with a little more tamarind sauce. Serve and eat whilst hot. Enjoy. Any leftover tamarind sauce can be stored in the fridge for up to a week. 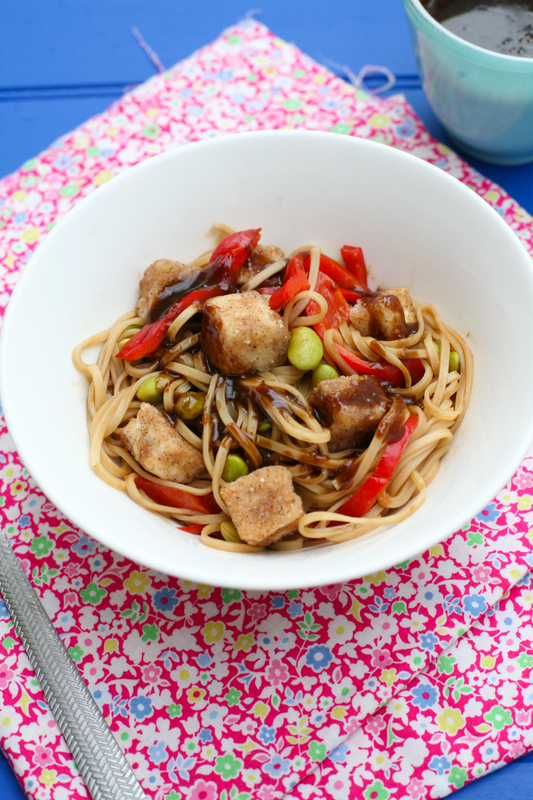 This entry was posted in noodles, Tofu, Vegetable, Vegetarian and tagged five spice, noodles, Sri Lanka, tamarind, tofu. Bookmark the permalink. looks divine! How does the tofu comes out? hmmm.. that sounds fantastic! thanks! Sorry to hear about your lack of heat, but thanks to your MIL for the sauce recipe and to you for putting this together. Sounds delicious.This will be on the menu this week. Oh gah, this looks heavenly! I want to make this now – truly! Thank your MIL for me. Bookmarking, pinning, stumbling, FBing etc. Torie, I am so trying this, the tamarind & five spice combination sounds delicious, especially with crisped tofu (very clever cornflour coating, I never thought of that! ).